Guilherme – A happy, young surfing gun! 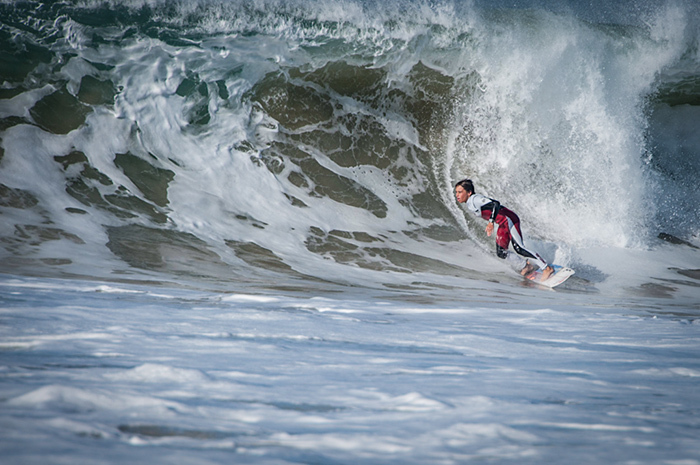 Good bye: Supertubos is a wave for the daring. Supertubos is a wave you can’t miss out when going to Portugal – no matter if you have the abilities to surf it or to just watch those crazy waves embracing the bold and skilled surfers who go deep into these powerful barrels. When you’re approaching the beach one can already hear the growling, the bursting of water masses on the sandy ground. It’s a spectacle. Who the…? Guilherme just before entering the barrel AGAIN. With only 15 years of age Guilherme surfed barrels in Supertubos for years and is a well known crack among the locals. Just recently he then won the Portuguese youth championship in the class of under 16 years old and under 18 year olds. And with the help of Rip Curl and other sponsors his competition career is picking up momentum. It was amazing to see him out there with other guys way older than him. His father who came to him to the spot this day was whistling for over an hour to make him come out – and he just continued to get one barrel after another. And it was amazing to see how casual he spoke in the interview to share his opinions on Peniche, surfing, life and traveling. Good luck, Guilherme, and keep enjoying your gift!